If you are looking for an easy last minute Christmas treat, here it is. I used the Holiday Peppermint Oreos, but you could use regular Oreos. All I did was melt down some white candy melts with some shortening until it was smooth. 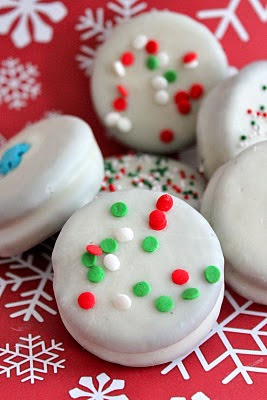 Then I dipped each Oreo one by one and topped them with some Holiday sprinkles. Just put them in a cellophane bag tied with a ribbon and you have a last minute personalized gift. Hope this helps!